Alex Alexander professional tour caddies golf classic. The annual caddy classic is named after the former tournament director of the B.C. Open, Alex Alexander, in Endicott N.Y. where the traditional tournament began in the late 1970’s and where it was annually held until moving that venue to Texas. Reason being Alexander is no longer the tournament director at B.C. and the new venue is opposite the Nelson and Colonial –where most all the tour caddies would be present to get a chance to participate. The earlier 'Alexander Opens' played in the 1980's and 90's in Endicott were great with the winner of the championship flight getting a spot in the pro am the following year there at the tournament (B.C. Open) And there have been some great winning rounds played there in caddy past on Monday. Former champions of those classics include Herman Mitchell (Lee Trevino’s old caddy), and Fluff Cowan. That great tradition continued this week in Texas at Crown Valley with Damon Green (Zach Johnson), D.J. 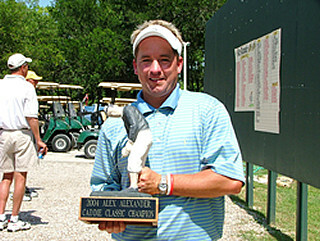 Nelson (Heath Slocum), and Brent Henley (Woody Austin) all shooting 68 -with Henley winning the title on the second hole of a playoff to become the 2004 Caddy Classic Champion. In Endicott N.Y., the Enjoie Golf Club sits low in a valley next to a river (which has flooded the course from time to time) and playing there early on Monday was always a good test of your ability to ‘pick’ your golf shot from a tight imperfect lie in the early morning from those wet worm laden fairways. This was the first year that Crown Valley was host to the caddy classic and the golf course -just two years old -presented a good test with a typical Texas turf of tight Bermuda fairways and rock firm and fast greens with no pool but a good bit of ‘pond’ out there in places. It was use full to ‘pick’ your shots here as well, and overall the ‘pickins’ were great with plenty of liquid refreshment and a catered lunch of Quesedilla’s and Bud when everyone was done. Henley attended Alexander State Junior College in Alabama where he played college golf from a school whose golf program turned out the likes of tour players Carl Petterson, John Huston, Per Ulrich Johansson, Gene Sauers, and Paul Tesori. Brent turned pro right after graduating and just got his amateur status back two weeks ago. He’s caddied for Woody Austin the past three years. Shawn Segers won the A flight with a score of 76, John Glinski the B flight with a 79, and Ron ‘Bambi’ Levin the C flight with an 85. PGA Tour official Irv Batten scored 83 to take the ‘Open’ flight. We had a lot of help setting up this years’ tourney with Andy Leno running this years tournament along with PTCA president Dale McElyea and Greg 'Piddler' Martin, and the usual hard work from Donna and Bob Shultz with Donna's brother Dennis and 'Jelly' Hansbury overseeing scoring. There also was a well stocked 'pond' provided via the graciousness of the PGA Tour players to help sponsor this annual caddy event's 'pool'. All the caddies are in agreement that it's a good experience to get to stand over those four footers when it matters to get a 'birds eye view' of what it's like to be on the 'player's' side of the ball again. Differing though in this event from a 'real' golf tournament in that the caddies got to buffer some of that tournament tension with lot's of laughs, some cold Bud's, and a great time again this year! -Click here for Caddy Classic pictures!